Much like cheese and wine, beef is one of those staples that turns magically more flavorful when kissed by age. For decades, steak junkies have been touting the virtues of dry aging (or meat hanging), in which the meat’s enzymes break down muscle tissue while lolling in temperature-controlled environments for at least a month. The process requires careful oversight as the flesh takes on a nutty, funky flavor that evades fresh cuts. Lou & Mickey’s is a well-established chophouse that recently incorporated a dry-aging room into its handsome, classic atmosphere. 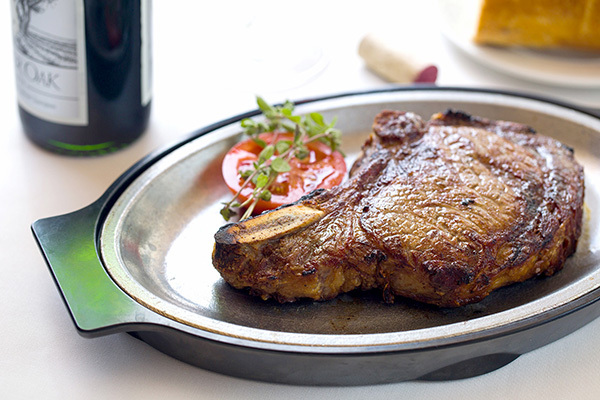 Visible to guests seated toward the rear of the restaurant, it’s well-loaded with an eyeful of New York strips, porterhouses and rib-eyes. We sat at a banquette table perched against one of the room’s windows. 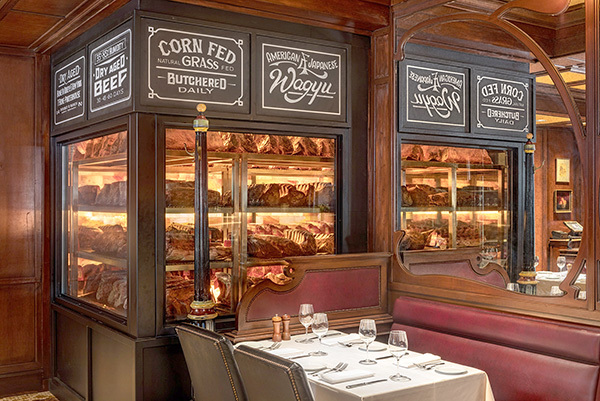 The display inside looked like something out of a 1930s butcher shop, with shelves of aging beef fitting right into an overall interior design reminiscent of an old-style Chicago chophouse. Visiting with my sister (coincidentally in town from the Chicago area), our dinner started with hot sourdough bread and softened butter, exactly the kickoff decent steakhouses like this should provide. We progressed to a couple of appetizers — one fairly new and the other a mainstay since Lou & Mickey’s opened in the early 2000s. 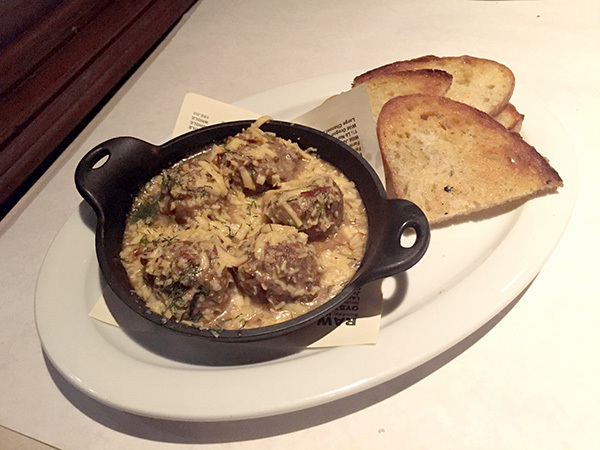 The former was a cast-iron skillet of five beef meatballs speckled with Gouda cheese and served in brown gravy — comforting and kind of Swedish in style. The other starter, crispy coconut wild shrimp, was excessively sweet — more so than coconut donuts. So viscous and sticky, hot hand towels are brought to your table afterwards. We needed every thread to free our fingers of the gnarly glaze that clung to the shrimp. Next time, I’m going straight for the grilled jumbo artichoke or the New Orleans barbecue shrimp instead. Our main entrees were thrilling: a pair of South African lobster tails for Sis, and a hunky dry-aged bone-in rib-eye weighing about 22 ounces for me. South African lobster tails are prized for their sweet meat, more so than those originating from Maine. I recently went gaga over them at King’s Fish House in Mission Valley, which falls under Lou & Mickey’s parent company, King’s Seafood Company. 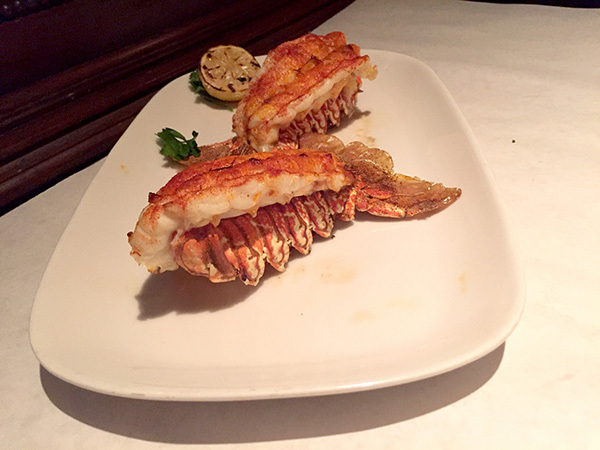 These tails were served exactly the same, each one lifted neatly from their shells, broiled and lightly seasoned. So sumptuous, you can actually skip the drawn butter and lemon served alongside. My steak was available in a choice of three dry ages: 30-day, 45-day and 60-day. I chose the younger of the three, which yielded the buttery and faintly robust flavor I prefer. The older varieties demand something of an acquired taste due to their intense flavor, which has been described by some as mushroom-y or overly intense. Though when aged beyond 45 days, the steaks turn supremely tender and pretty much cut with the side of a fork. Mine was cooked medium as requested and cut easily with a knife. From end to end, it oozed of clear, flavorful juices and offered more depth of flavor than any steak I’ve consumed in the past few years, including one I ate most recently at a certain highfalutin national chain. Side dishes are sold a la carte. We chose fire-roasted broccolini with tahini and feta — a commendable preparation of the bitter-green vegetable — and what could have constituted as the world’s largest baked potato. To boot, we opted for a full loading of butter, sour cream, cheese and bacon inside of it. Needless to say, more than half of the tuber came home with me and was joyfully consumed the next day. In addition to a range of steak and seafood options, the menu features Colorado rack of lamb; chargrilled chicken; a few pasta dishes including linguine with clams; and raw bar offerings such as oysters, stone crab claws, and iced shellfish platters of various sizes. There’s also a full bar that makes stirred, shaken and exotic drinks. The booze choices extend as well to nearly two dozen local craft beers on tap and a well-rounded selection of California and international wines. Desserts are made in-house. 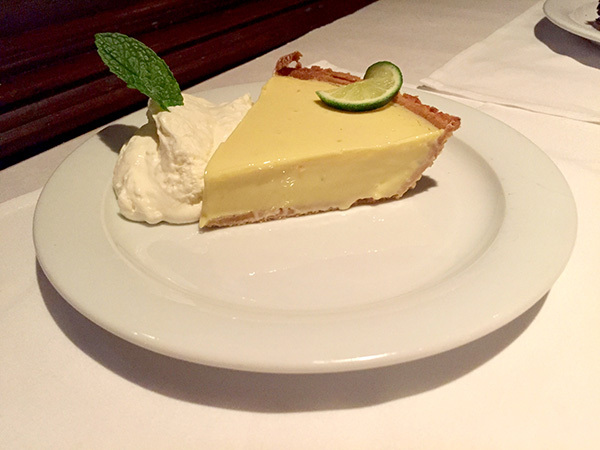 When we were told the key lime pie contains Nellie & Joe’s Key West Lime Juice, a chief ingredient that goes into the pie’s original Florida recipe, I was sold. The contrast between the very tart curd and sweet graham cracker crust was excellent. There’s also a multi-layer chocolate cake with chocolate frosting, New York cheesecake, caramel apple cobbler and more. 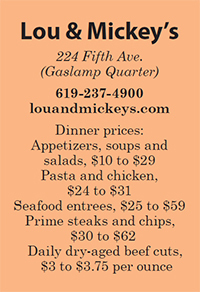 The thing I like about Lou & Mickey’s is the courteous tribute it pays to steakhouses of yesteryear. Service is formal without being pretentious, the interior design feels familiar rather than trendy, and the food doesn’t veer too much outside of the classic tried-and-true steakhouse type. — Frank Sabatini Jr. is the author of ‘Secret San Diego’ (ECW Press), and began his local writing career more than two decades ago as a staffer for the former San Diego Tribune. You can reach him at fsabatini@san.rr.com.